Royal Palm Turkeys are a breed of Turkey best known as an ornamental bird with a unique appearance, largely white with bands of metallic black. Royal Palm Turkeys first appeared in the 1920s on a farm in Lake Worth, Florida, apparently as a cross between Black, Bronze, Narragansett, and native turkeys. After years of selective breeding the Royal Palm was finally accepted by the American Poultry Association's Standard of Perfection in 1971. The toms are noted for being non-aggressive, and the hens are particularly good mothers, but they are too small for commercial use. They are primarily kept as an exhibition bird, or on small farms. Royal Palm Turkeys are a very endangered breed. They are on the watch list with the American Livestock Breeds Conservancy. They are also included in Slow Food USA's Ark of Taste, a catalog of heritage foods in danger of extinction. And Australia and The US both report the breed as Endangered. 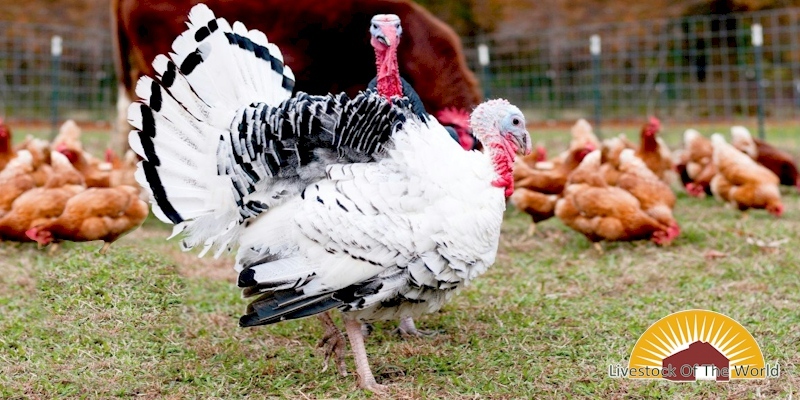 In Europe, a turkey with similar coloration is sometimes called the Cröllwitzer, Pied, or Black-laced White.